Five major roads radiate out from Alston. One heads north down the South Tyne valley, the other four all climb up out of the valley in to adjoining valleys. Interesting walks are to be found in any of these directions. Firstly heading south-east one leaves Cumbria and enters Teesdale where one finds Cow Green reservoir, the area around which is the only place in England where spring gentian grow. At the right time of year these can be admired on the walk from the car park to Cauldron Snout. The Moor House – Upper Teesdale leaflet contains details of the walk and the information point near the car park usually contains copies. 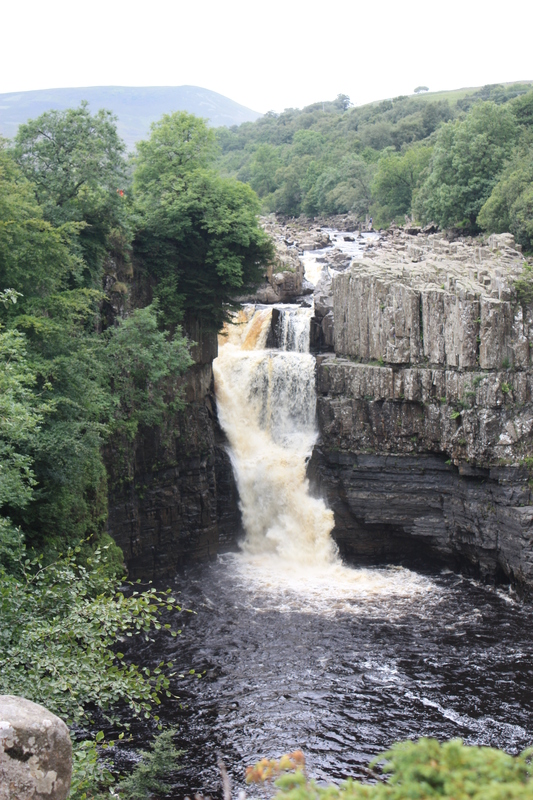 A few miles further down the Tees is High Force said by many to be England’s most impressive waterfall. A good starting point for the walk to High Force is Bowlees Visitor Centre from where several other walks may be started. Continuing on down the valley one comes to Barnard Castle, a recent addition to the Walkers are Welcome fraternity. Their website is a useful source of information about walks in the area and more general information about the area. Between Alston and Barnard Castle lies Middleton-in-Teesdale soon to be a Walkers are Welcome town. Walks in the area are to be found on Teesdale Challenge Walk. North of Teesdale is Weardale with its wealth of industrial archeology including Killhope the home of the North of England Lead Mining Museum. For more industrial archeology the walk up Middlehope Burn from Westgate is recommended. To the north-east are Allendale and Hexham whereas the road to the west passes over Hartside summit complete with its cafe from which one can admire the view across to the Lake District. In between lies the expanse of the Eden Valley. The Visit Eden website contains a wealth of information about the area in general and about walking in particular. Also worth a visit are Long Meg stone circle and nearby Lacy’s caves. The only road that does not climb is that northwards along the river valley to Haltwhistle, which hosts an annual Walking Festival, and to Brampton, also a Walkers are Welcome town. Close to Brampton are the RSPB nature reserve at Geltsdale with marked walking trails and Talkin Tarn Country Park. For those interested in Roman history Hadrian’s Wall is but a few miles further north.